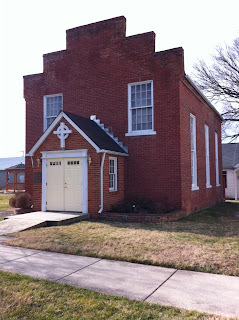 As part of a Doctor of Ministry project to explore the history of my congregation, I recently found myself digging through some fascinating background research done a decade or so ago into the history of my 150-plus year old community. It's nifty stuff, because I love the richness of stories that echo from the past. Part of the research included poring through a listing of all of the historic buildings in the little town of Poolesville, along with pictures and a short blurb about the provenance and use of the buildings. Leafing through the pages, one building in particular caught my eye. It's a yellow-painted brick building, one that sits to the left of the road as you approach the intersection of the One-Oh-Seven and Elgin from the East-South-East. 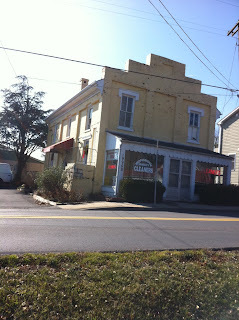 It houses a dry cleaner now, but according to the historic documents, it was not always a business. It began as a church. It was Poolesville's first Baptist Church, built in 1865 or so, about twenty years after the construction of my congregation's sanctuary. It isn't, as best as I've been able to tell, the formal progenitor of the healthy and dynamic Baptist community now thriving in Poolesville. Having driven past it for nearly four months, I'm amazed I didn't notice the similarity. The front facades are nearly identical, sharing that blocky, built-out-of-Lego stepped appearance. The windows facing the street are in nearly the same position. Peeking in to the glassed in reception area of the cleaners, you can see where the original door into the church was once large...a big church door, one that would have received worshippers before they arrived. The two buildings are close enough in appearance to be sisters. I couldn't help but wonder about the community that once gathered there, worshipping and praying and singing. Back then, as the glowing ashes of the Civil War settled, these two small fellowships would have been very similar in size and dynamics, if perhaps not in the less-relevant points of theology. Digging deeper into the history of the community, providence passed a book my way written by one of the keepers of the town lore. I find that the Baptists who built that church began their fellowship as a tenant congregation of Poolesville Presbyterian. When the time came to build a church of their own, they just built a slightly nicer version of the church they'd been worshipping in for a decade. Poolesville Presbyterian has chugged along for over 150 years. It sputtered and dimmed for a while, closing for a handful of years in the middle of the last century before re-opening. But for the little sister Baptist church, well, faith didn't stick there long. It ceased to be church, sometime around the turn of the last century. By 1900, it was a millinery. Then a fuel oil distributor. And then a cleaner. Yet still, if you stand at the front of the building, there are echoes of the faith that must have started her. In the left "eye" of the facade, the topmost window still holds a little flash of color, a little twinkle of stained glass as an echo of the church that once lived and hoped and worshipped there. Odd, how the faith in buildings can remind you of the faith of people.